Furnishing: holiday standard, well-kept, tiled floor, parquet floor, laminate floor. Please note: Owner and further holiday makers live in the house. apartment, 4 - 6 people, 3 room/s, 2 bedroom/s, 1 bathroom/s, approx. 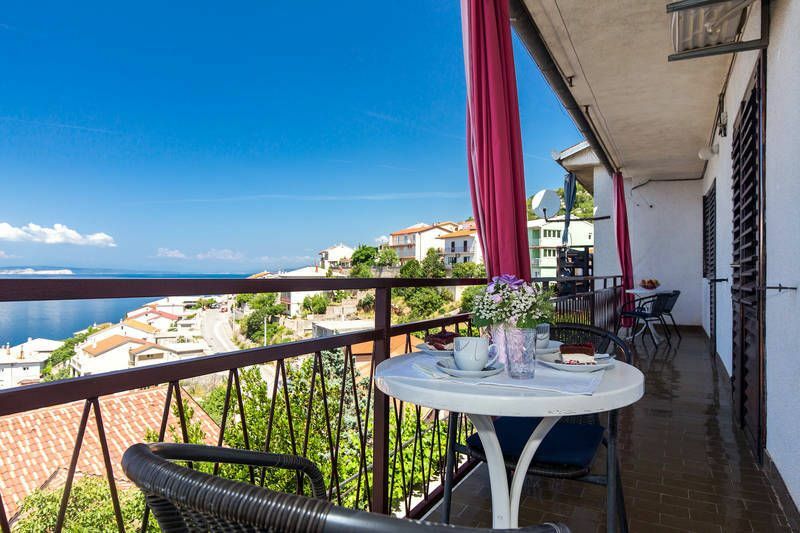 70 m², 1 floor/s, apartment on floor 1, sea view, access to the property via external stairs. Bedroom 2: double bed, single bed, exit to balcony. Kitchen: Kitchen/ cooking equipment: 4 induction fields, combination fridge-freezer, coffee machine, water boiler, toaster. open to the living room. Living room/bed room: sofa bed (1.60 m wide). Access/parking: Access to the house via stairs (15 steps). Outdoor facilities: (shared use): terrace, gas barbecue. Situation: residential area, holiday village, view of Krk, Rab. Plot description: 2 x parking on the estate. balcony 12 m² (roofed), furnishing provided, 2 sun loungers. Arrival: Airport Rijeka/Krk in approx. 53 km. Beach/waters: Pebble beach (without crossing the street, via stairs) in approx. 350 m. Pebble beach in approx. 500 m. Sea in approx. 350 m.
Next village/town: Center Senj in approx. 1 km. Klenovica in approx. 14 km. Novi Vinodolski in approx. 21 km. Shopping: Next supermarket (Senj) in approx. 400 m.
Die Ferienwohnung ist zweckmäßig eingerichtet. Sie bietet ausreichend Platz und es ist alles da was man als Familie benötigt. Der Meerblick ist fantastisch. Die Vermieter sind sehr freundlich und hilfsbereit. Der Weg zum Meer und zurück ist leider etwas beschwerlich, da man 300 Stufen gehen muss. Die Strände sind lang und es gibt auch kleinere Buchten, aber leider sind alle vollständig schattenlos.